All who love to sing are welcome. The Adult Choir leads the singing at the 10:30am Mass on most Sundays throughout the liturgical year, and sings at the 4pm Mass on Saturdays every second weekend of the month. This choir also sings at various events and fundraisers throughout the year. Singers and instrumentalists are ALWAYS needed. Prayerfully consider joining us in this ministry of music. Rehearsals are 6:30pm on Wednesdays, in the Church. 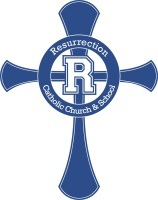 Resurrection Children’s Choir is open to all children from 2nd thru 5th Grade. This choir sings at the 10:30am Mass every second Sunday of the month and on Holy Days, such as Christmas and Easter. Rehearsals are on Wednesdays from 5:30pm to 6:15pm in the Church. The adult contemporary band leads the singing at the 5:00pm Sunday Mass. Young adults are most welcome to join their voices and instruments in this ensemble. Rehearsals begin at 3:30 pm on Sundays in the Church prior to Mass. The Spanish Choir leads the singing every week at the 12:30pm Spanish Mass. All those who enjoy singing and playing Spanish liturgy are welcome to join. Rehearsals are 7:30pm on Wednesdays, in the Church.